Check out the Finance Recruiting 101 Presentation to review this year’s process and use Handshake to schedule a career advising appointment to discuss your search strategy. Participants are invited to Morgan Stanley’s New York Headquarters to gain insight into our businesses through a variety of workshops, network with employees, and participate in the first stage of the Summer Analyst recruiting process. You will be asked to rank your top 3 divisions of interest. Before selecting your divisions of interest, we encourage you to watch our Morgan Stanley webinars to help you make an informed decision. After submitting your application you will be asked to complete an additional video component via HireVue. You will receive a separate e-mail with information on how to complete this step within 72 hours of submitting your application. We encourage you to account for this step in your application timeline. You may apply to as many Early Insights Programs as you are eligible for and interested in, but can only be selected to attend one. All events will be held at our offices in New York City; participation is limited. Morgan Stanley will provide travel and hotel accommodations for selected applicants. As a sophomore, now is the time to bring focus to your career path and develop the essential skills that will help you succeed after you graduate. Use the Sophomore Springboard diversity program to prepare for a future career in financial services. During the program, you will take part in business workshops, as well as specialized soft skills training and interview preparation. There will be plenty of opportunities to network with Barclays employees and your fellow program participants. As one of our diversity programs, Sophomore Springboard is designed to attract and educate high-achieving, underrepresented candidates, including LGBTQAI, Veterans, Women, Black, Hispanic/Latino, Native American and Disability students. Register your interest by February 4, 2019. Complete your application by February 7, 2019. You will receive a link to apply via email after registering your interest and before the application deadline. Candidates will only be considered for one division; please do not submit more than one application. Complete your pre-interview assessment powered by Koru. You will receive instructions for this via email upon completion of your application. We partner with top companies to train college students for free to help them land their dream jobs. ModernGuild partners with leading companies to curate year-round training and interviewing opportunities designed to equip college students with the core competencies and the self-confidence they need to land their dream jobs. The Final Application Deadline is February 7th. Applications will be reviewed on a rolling basis, so we encourage you to apply early! This program is free for students, provides one-on-one mentoring, and exclusive interviews with program sponsors like Citi, Barclays, JP Morgan Chase, Macquarie, Deloitte, pwc, Nomura, Bloomberg, Credit Suisse, Moelis, Point72, Goldman Sachs, TD Bank, The Kresge Foundation, Aksia, Brown Advisory, and Kalypso. To learn more, please visit modernguild.com. Are you a first-year or sophomore who is interested in the financial services industry? The boot camp will provide you with a thorough exploration of the industry, the participants in the industry, and the myriad of career paths available. You will learn the difference between the Sell Side and the Buy Side, including the role of the investment banker, capital markets, asset management, hedge funds, private equity, private wealth management, and supporting functions. You will walk away with an understanding of financial terminology, roles within the industry, and confidence to help you build your network. The boot camp will be facilitated by Stephanie Hockman who brings over 20 years’ experience in the financial services industry. She is currently Program Director for Careers in Business and Finance at Loeb Center for Career Exploration and Planning at Amherst College. Prior to her current role, she worked at BNP Paribas as a Managing Director in Global Equities and Commodity Derivatives (“GECD”) leading teams in New York, London and Hong Kong as well as leading the internship and analyst/associate programs. Prior to BNP Paribas, Stephanie was a Principal and head of relationship management at Banc of America Securities. Stephanie started her career at Arthur Andersen as a tax consultant after earning her Bachelor of Business Administration (BBA) and Master in Professional Accounting (MPA) at The University of Texas at Austin. To participate register via Handshake and send your resume to UOlender@middlebury.edu by Noon on January 14, 2019 (Deadline has been extended). Space is limited. Space is limited and first-years and sophomores have priority. If you are a junior or senior who is interested in attending, please email UOlender@middlebury.edu to request that you be added to a wait list. Middlebury students who interned in financial services roles last summer were asked what training/experiences they wished they had prior to embarking on their internship. The overwhelming response was that they wanted more financial analysis and Excel training. In response to student demand, the Center for Careers and Internships will host an Accounting & Financial Modeling Liberal Arts Boot Camp at Middlebury College on the weekend of January 26-27, 2019. DEADLINE EXTENDED to Monday, January 14, 2019. Taught by financial training firm Wall Street Prep, this intensive 2-day seminar bridges the gap between academics and the real world to give you the practical Excel, accounting, and financial modeling skills you will need during the recruiting process and on the job. This intensive workshop is taught by an industry practitioner who conducts training at the world’s top investment banks, financial institutions, and Fortune 500 companies. $190. This enrollment fee represents over 80% educational discount relative to WSP’s corporate training fees. Please email Ursula Olender at UOlender@middlebury.edu if the cost of this course is a hardship. “I’m In!” How Do I Register? Learn more and register online at: https://www.wallstreetprep.com/seminars/middlebury-college-012618/. The deadline to register is Monday, January 14, 2019. Hurry space is limited. **For those requesting financial aid – contact Ursula before registering via the link. The liberal arts education that Middlebury provides prepares students for success in a wide variety of roles in financial services. Come learn more about the range of opportunities in this ever changing field. Join seasoned financial services professional Pam Czekanski ’81,P’18,P’20 for an informal conversation. Pam is a Vice President of Loomis, Sayles & Company, and associate director of client service. Loomis Sayles is an investment management firm that manages over $260 billion. In her role, she works closely with corporate pension and endowment clients on their portfolios’ asset allocation and helps provide solutions to the investment challenges they face. She has also worked with individual clients as they work to reach their financial goals. Pam has over 30 years of experience managing institutional equity and fixed income portfolios for institutional and high net worth clients. After graduating from Middlebury with an economics major and a concentration in music history, she went on to earn the Chartered Financial Analyst designation. 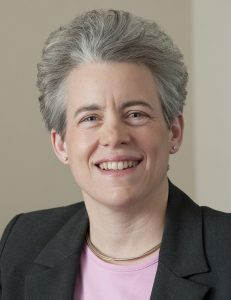 She has served as a Trustee of Middlebury, President of the Boston Middlebury Alumni Association and is currently a Trustee of the Bolton MA Public Library after serving as Co-Chair of the Library Construction Committee from 2006-2009. Pam is a member of the Finance Committee of the Forsyth Institute, a leading research institute focusing on oral health. She is also a member of the Boston Club, whose mission is the advancement of women on corporate and nonprofit boards.